LP records further calculations on the structure of nucleic acids into his research notebooks. 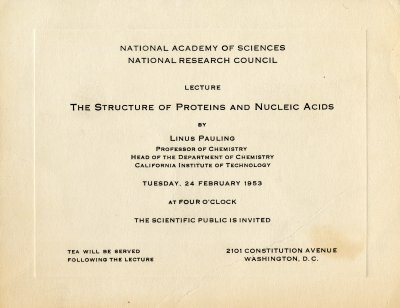 Letter from Peter Pauling to LP and AHP RE: Discusses nucleic acid structure: "We still feel that the structure requires sodium, and somewhere near the oxygens, whose negative charge must be cancelled, to hold the molecule together. We agree that everything is a little tight... Actually, it is thought at the Cavendish that the structure is pretty good. We have nothing better to offer." Goes on to discuss finances, traveling, and cars. [Filed under LP Biographical: Box 5.041, Folder 41.6]. Happy birthday, Daddy. I hope the next year is as successful as the last. Thank you the letters. We still feel that the structure requires sodium, and somewhere near the oxygens, whose negative charge must be cancelled to hold the molecule together. We agree that everything is a little tight. An unimportant point is that the pictures are of DNA and the structure of RNA. Actually, it is thought in the Cavendish that the structure is pretty good. We have nothing better to offer. Mamma, thank you very very much for my curtains and the surprise. My room takes on an entirely new aspect and ceases to be the dull, Cambridge hole it was. I had thought about divinity at Christmas and in January, but did not think it possible. It is grand. I ration myself, but liberally. I was very excited and glad to see Sid. We must have a party. Re automobiles: Convertible 4 seater Sunbeam-Talbot:2 1/4 liter engine 70 b.h.p., 2865 lbs, w.b. 8ft 1 ", 895 in England. Well, I am almost in favor of a cheaper car; I prefer extremes. For instance, the Austin A-40 Sports 4-seater has 1.2 liter, 50bhp, 2068 lb, w.b. 7ft 8 " 586, $1640. The Hillman Minx convertible 4-seater (Linus has one) is 1 1/4 liter 37.5 HP, 2016 lb, w.b. 7ft 9" 510, $1430. Notice that the Austin (a slight factory hop up) gets 50 bhp from 1.2 liters and the Sunbeam gets 70 from 2.26 liters. The Sunbeam Talbot looks pretty nice, and has a little more room than the Austin, but I don't think it is worth the extra $900. I think a Jaguar is worth the extra $1800 in space, comfort, and performance well maybe not. It would be better not to have a Jag in Europe. If you plan to leave the car here for more than one year, it should be bought and licensed, at least licensed, in France. One gets a "TT" International license plat there. It requires being in France once a year. I shall inquire among my friends here and at DNR London to see what the best thing to do is. Don't be in too much of a hurry. I went to the RI on Monday, and Riley and I had great fun. He took me to his club for supper. Very interesting. His wife is very nice. Presumable he has written you about USC. I told him all I knew about the place, not very much. Say, you might bring over a couple of etchings if it is convenient. I am beginning to hunt around for pictures, and have bought one, but need more. They can be framed here. You can bring a Navaho rug, too. I am toying with the idea of a Persian rug, but presumably they are a little expensive. British rugs are all flower and dull. "Don't show the dirt, my dear." Like everything else. Morgan builds an open four seater. It would be like the MG with four seats. No windows and no luggage space. 2.09 liters, 68 bhp, w.b 8ft, 1,736 lb. 580, $1620. More oomph than the Austin; and more sporty. I think I recommend the Austin A 40 Sports. Space is not great but about equal to the Sunbeam and Hillman. Sid Bernhard would appreciate it if you would send his manuscript. I shall probably go to London on April 1. and meet you there when you arrive. Might go to Oxford afterwards. Might go skiing in Austria, but doubt it. Would you please send $3.50 or $7.00 in the enclosed envelope? Makes me homesick. Many thanks. I like my Valentine very much. You are all darlings. Alfred Tissiers has a beautiful 1939 Bentl[e]y with a French closed 4 seater bod (sliding roof panel) which you can have. Plenty of space in it. Fast, powerful. Reasonably cheap, I expect. It is really too expensive to run her for him. It would be grand for me. I like closed coupes. Bragg may be next director of the R.I. He has been offered, but may not accept. If he does, the MRC unit presumably will mover there. What for me? This all unofficial and on the Q.T. Don't ask Bragg yet. How about thinking a little about insulin? No big guns brought to bear so far. M.W. 12000, much data.